The 14th century papal palace in Avignon, saved from the depredations of 18th century French revolutionaries because it was too big and difficult to knock down. 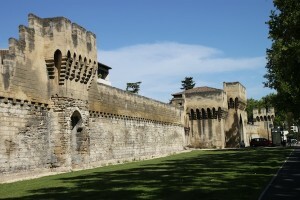 Historic walls surrounding the old center of Avignon. medieval papal palace and other places I had not seen since leading a teenaged nephew through these parts nearly three decades ago. The warm weather and late-afternoon light were irresistible — and new digital equipment let me take as many unnecessary photos as I wanted without producing a pain in the pocketbook.